So, my last post was about the creation of Boo’s birthday cake. There was one thing about the whole cake experience that made me laugh so hard that I couldn’t sing “Happy Birthday” with everyone. It was his second birthday! If you know me in real life or have been reading here for a while you know that I often have grand ideas that just don’t play out in reality. Well, it happened, once again, with Boo’s birthday cake. I, as I tend to do, waited until the last minute to set to work on said cake. As in I was looking at the recipe and buying the ingredients the morning of his birthday. First things first. When I read the recipe thoroughly I noticed that it was going to take 19 egg whites, yes, nineteen. I decided that instead of making the cooked buttercream in the recipe I would make Wilton’s buttercream and use lemon extract instead of vanilla to flavor it. That part worked fine and the icing was very tasty. 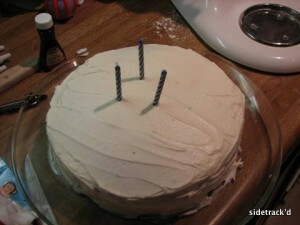 As for the cake itself. I gathered all of my ingredients, my gel food coloring, my Kitchenaid stand mixer, and my new kitchen scale. I prepared the cake batter (of course, all three kids woke up from naps right as I started putting ingredients in the bowl) and set it on the scale. I figured in my head the weight I would need to make each layer in order to get six colored layers. 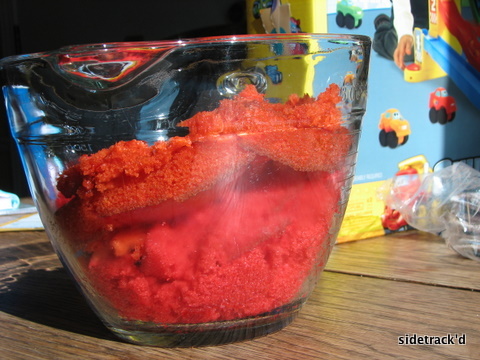 I divided the first couple of layers out and added the appropriate food colors (red and orange). I oiled the pans as directed and popped them in the oven to bake. 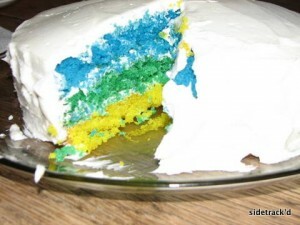 While those two layers were in the oven I prepared the yellow layer and got it in my third cake pan and then set to work dividing and coloring the green and blue layers. As I weighed the batter for the green layer I realized that I wasn’t going to have enough batter to make both a blue and a purple layer as well. Oh well, five layers would be fine, not a big deal. Meanwhile, the red and orange layers are out of the oven and have cooled in the pans for about 10 minutes. I flipped the pans to release the cakes onto the cooling rack and the cakes didn’t budge. I ran a table knife around the edges of the pans and tried again. Still nothing. I put the pans upside down on the cooling rack and banged on the bottom of each pan. Nada. Finally, I scraped the red and orange cakes out of the pans and ended up with piles of cake crumbles, very sticky cake crumbles (which tasted delicious, by the way). At this point the yellow layer was in the oven. I tried to decide if there was anything I could do to salvage the crumbled layers or if I should just scrap the idea and go buy a cake. After much deliberation it was decided that the cake preparations would continue and we would just go with whatever we ended up with (even if that meant cake crumbs instead of a cake). So, when I prepared the pans for the green and blue layers I greased and floured them to see if that would make them release better. The yellow layer came out of the oven and Matt was able to (very) delicately work on the cake and get it out of the pan in one piece. One down, two to go. The green and blue layers finished baking and cooling, and I set to work trying to remove them from the pans. The greasing and flouring of pans did not make a bit of difference; they were just as stuck as the other layers. Matt again worked his cake releasing magic and we had three layers for the cake. I moved the yellow layer from the cooling rack to the glass plate on which I was going to assemble the cake. The plan was to let the green and blue layers cool and then assemble the cake as green layer on the bottom, yellow layer in the middle, and blue layer on top. When I went to pick up the yellow layer to put the green layer on the plate, the yellow layer was not going to come off easily. Scratch that idea. 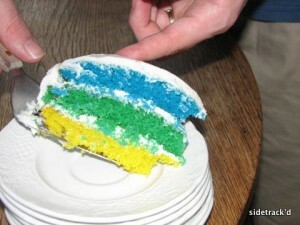 We ended up with a yummy cake composed of yellow, green, and blue layers. 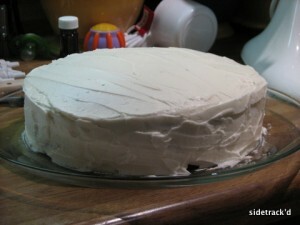 It wasn’t exactly what I set out to create, but it was a delicious cake (the lemony icing was a perfect complement to the cake) and we ate every bite. Most importantly, Boo really liked it. 1. Think back a decade, do you remember what your first cellphone was? Was it as cool as Zack Morris’s phone? My first cell was Nokia something or other (in 1995). It was not nearly as cool (or large) as Zack’s, but I do remember my parents having one like that. 2. What is the first children’s book you remember being read to you? The first book I actually recall being read to me was Stand Back, Said the Elephant, I’m Going to Sneeze. I’m sure there were many, many before that (I remember being read to A LOT, especially by my brother), but I don’t remember specific books. 3. What was your first car? Did you love it or hate it? A 1993 soft top Geo Tracker (white). I loved that car. Funny story about it – when I decided that was the car I wanted my uncle tried multiple times to talk me out of it saying it was too dangerous, too much of a risk to flip, etc. Now he drives it. 4. Who was your hero growing up? My dad and my brother. 5. Think back to your first kiss. Was it everything you dreamed of? Umm, no. Mainly because it was a kiss from someone that I really had absolutely no desire to kiss. I had a bowl cut when I was preschool age, but that wasn’t really my choice. In early elementary I had a really bad choppy layers mullet-y thing. And then, my senior year of high school I got a “Rachel” shag. That was bad. Hair as thick as mine and that kind of style do not mix. I wish I had the pictures to share because it would definitely be good for a laugh. I don’t remember the first one, but the scariest one was when I was pregnant with Baby Girl and dreamed that the ultrasound showed she was a cat. 8. What was the first phobia you remember developing? Probably either spiders or snakes. 9. Which character on Sesame Street do you most identify with? Cookie Monster has always been my favorite. I can relate to never being able to get enough cookies. 10. What was the hardest goal you ever accomplished? Getting an “A” in Organic Chemistry is the first one that comes to mind (that class about killed me), followed closely by potty training Little. We spent this weekend in Nashville visiting with family. It was a lot of fun getting to see everyone (Matt’s parents, my parents, all of our grandparents, Lu’s hubby, and various other family members), but I am tired! 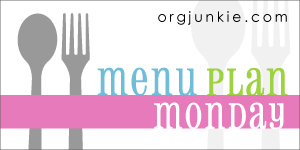 As always, for more menu plans and meal ideas, visit Menu Plan Monday. I hope everyone is having a happy Monday. Have a great week! …I love to sing and dance. …I LOVE to play outside and ride my bike. …I have a thing for shoes. I will take anyone’s shoes and wear them. …I love to torment my sisters and make them squeal/cry. …I like trains, dinosaurs, trucks, cars, and balls. …I can speak in sentences of several words and my vocabulary grows daily. …I like to give hugs and kisses and snuggles (but only for a few minutes). …I am a busy boy who is always on the move. …Mommy & Daddy have to call my name often for doing things I shouldn’t. …I am 100% all boy (even if I do like to wear my sister’s shoes). …I really like pizza, spaghetti, hamburgers, and chicken tenders/nuggets. …I LOVE fruit (except pineapple) and eat several servings a day. …I have some crazy, thick hair that sticks straight up at the crown of my head. 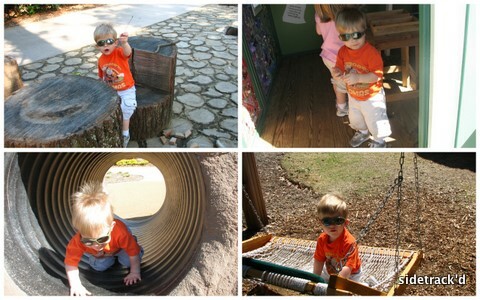 …I like to watch Super Why, Bob the Builder, Veggie Tales, and Dinosaur Train. …I have a quick smile for everyone and easily charm all the ladies in my path. …I gave up my paci (“mah”) last week (mostly without a fight). …I burst into rooms Kramer style. …I love hard (sometimes literally) and am loved very, very much. For the last few weeks I’ve been trying (unsuccessfully) to convince Boo that he should give up his paci when he turns two. The whole “you’ll be a big boy” spiel has failed along with the “only babies take pacis” route. In my latest venture I decided that maybe bribery was the way to go. Me: Would you trade your paci for a soccer ball? Me: Would you trade your paci for a new dinosaur? Me: Would you trade your paci for a new train? Me: Would you trade your paci for a slide? Little: I’d trade my thumbs for an octopus! Yes, I do realize it is Tuesday (and that I’ve already posted today), but I’m backdating this post to Monday and posting my menu anyway. Look at me being the rebel. Not only that, but I’m going to go back to last Thursday with my menus to get some recipes linked. And, yes, we really do like pizza that much! You are currently browsing the Sidetrack'd weblog archives for April 2010.